It is crucial for large hospitals to build a high performing referral network as they serve a huge community by providing them services in primary care and a variety of specializations. Large organizations spend months or even years building a referral management solution for their network which appears to have the right components on paper, but the patient referral volume continues to decline. 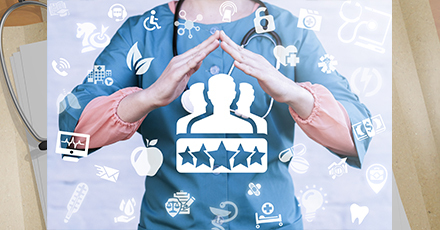 Here are the 3 best practice solutions that can create a high impact in improving the existing referral management process in Large Hospitals. The primary step to retain patients within the network is to accommodate their preferences. It is important for the health system to consider patient’s preferences before initiating a referral. Most patients prefer to choose the receiving provider based on a number of convenience factors like insurance, language, availability and distance. When a patient is paired with the receiving provider who best matches his/her preferences, it is more likely for the patient to visit the provider. Also, when the patient’s experience with the referral is good, it is more likely for the patient to stay within the network. HealthViewX Patient Referral Management Software takes care of updating your provider database with details of specialists newly added to the network. The “Intelligent Provider Match” feature allows physicians to filter and search providers based on patient’s convenience factors like operating hours, location, language, insurance, distance etc. A patient may need to see a specialist in a different facility within the same hospital. In most cases, the EMRs will be different. EMR Interoperability will allow facilities to share the patient’s records in real time without compromising patient security or privacy. Providers, patients and insurers all benefit from increased access to the patient’s medical information. Also, interoperability is an essential part of the Government’s Meaningful Use Stage 2 requirements. Meaningful Use Stage 2 will affect Medicare payouts for health care providers in stages, eventually leading to reduced payouts to all providers that take Medicare and do not follow the guidelines. Seamless functioning between EMRs like Epic, Cerner, Athena Health, Greenway Health, Allscripts, Nextgen, etc is important. HealthViewX Patient Referral Management Software acts as a bridge and enables seamless communication of data between the referring and receiving ends. Tracking referral data is often the most underestimated and impactful component of a high-performing network. By having real-time visibility of the complete referral ecosystem, health systems can gain actionable insights on how to take meaningful decisions on referral process, provider relationships, etc. Large Hospitals should be able to track referrals in various status, referral loop closures, percentage of referrals flowing in and out of network, referrals sent to different specialities, insurance provider, etc. HealthViewX Patient Referral Management has a customizable referral-centric dashboard that helps in tracking the number of referrals and gives complete information about the referrals processed, missed, scheduled etc. It can also be customized for different locations based on the priority of the large hospital. HealthViewX Patient Referral Management solution smooths the referral process and solves most operational challenges for Large Health Systems. Do you want to know more about HealthViewX HIPAA-compliant Patient Referral Management solution? Schedule a demo with us. This entry was posted in blog, Referral Management and tagged medical referrals, patient specific, referral management, referrals on March 29, 2019 by Helena Nancy.